There are any number of insects I am not fond of. Either they bite and sting and otherwise cause suffering and misery, or they are disturbing to look at, such as mosquitoes, gnats, horseflies. And there are some that I tolerate because they do good and useful things, like spiders and bees. Then there are the pretty insects. Butterflies, some moths, and my very favorite, the dragonfly. Dragonflies have fascinated me since childhood. 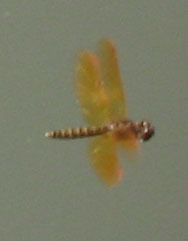 They have those elongated bodies and shimmery wings that move so very fast. And they come in such a wide range of size and color. I have seen dragonflies about the size of a quarter. 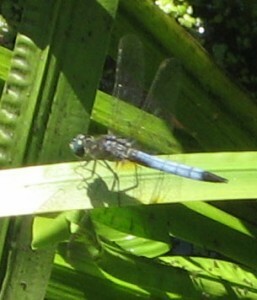 Then I have seen dragonflies the size of hummingbirds. They are particularly bountiful along streams and ponds and rivers, and I love to watch them take off and land. 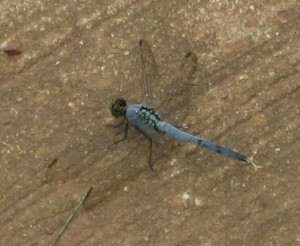 I have worked hard to capture many photos of dragonflies. They do not sit still for long, and are seldom keen on letting me get too near. But I have had some success over the years, and thus have shots of some beautiful specimens of these fascinating insects. As a child, I thought of dragonflies as ant helicopters. My vivid imagination was capable of seeing them land, pick up their passengers, whiz them off to the next destination, and repeat the cycle. Tiny transportation for smaller, less mobile creatures. Dragonflies have of course been a source of inspiration to many others. The spacecraft Lexx in the program of the same name was an immense dragonfly-shaped vessel. The bubble craft Tom Cruise’s character in the movie Oblivion flies around in has a rather dragonfly-esque look to it. Some see dragonflies in a more sinister light, but I think they are beautiful, colorful creatures. And let’s face it, employing the name ‘dragon’ often evokes all kinds of cool fantastical images…at least for geek-kind. Truly a wonder of the wondrous world, Dragonflies are magical, colorful creatures that are mostly harmless to humankind, and wondrous to behold. What do you think of dragonflies? I am MJ Blehart, “Wednesday’s Wondrous World” photographer and wordsmith. Every week I share a magical wonder of this amazing world, and I hope you will enjoy the journey with me!